Chanel Gondola ist der jüngste Neuzugang meiner Chanel-Sammlung und ich liebe diesen Lack! Er ist bereits als Teil der Chanel Venice Collection im Herbst 2009 herausgekommen und aus unerfindlichen Gründen habe ich ihn mir damals nicht gekauft. Eine Freundin von mir allerdings schon und als ich sie kürzlich gefragt habe, ob ich ihn mir für eine Swatch-Session ausborgen kann, hat sie ihn mir einfach geschenkt!! Chanel Gondola is the most recent addition to my Chanel collection and I am super excited about it! 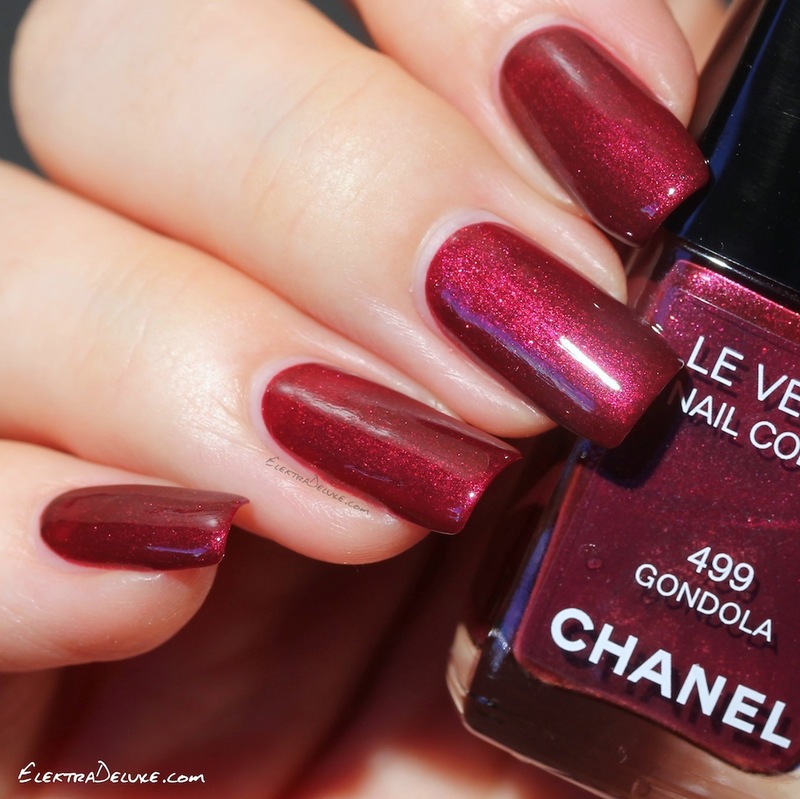 It was already released as part of the Chanel Venice Collection in fall 2009 and for reasons unknown to me I didn’t get it back then. But a friend of mine did and when I recently asked her if I could borrow it for a swatch session, she gave it to me and said I could keep it!! Chanel Gondola ist ein beerenfarbener Lack mit wunderschön tiefgründigem Schimmer. Der Lack erinnert mich an Zoya Teigen, nur der Schimmer ist bei Gondola dezenter. Ich habe 2 Schichten aufgetragen. 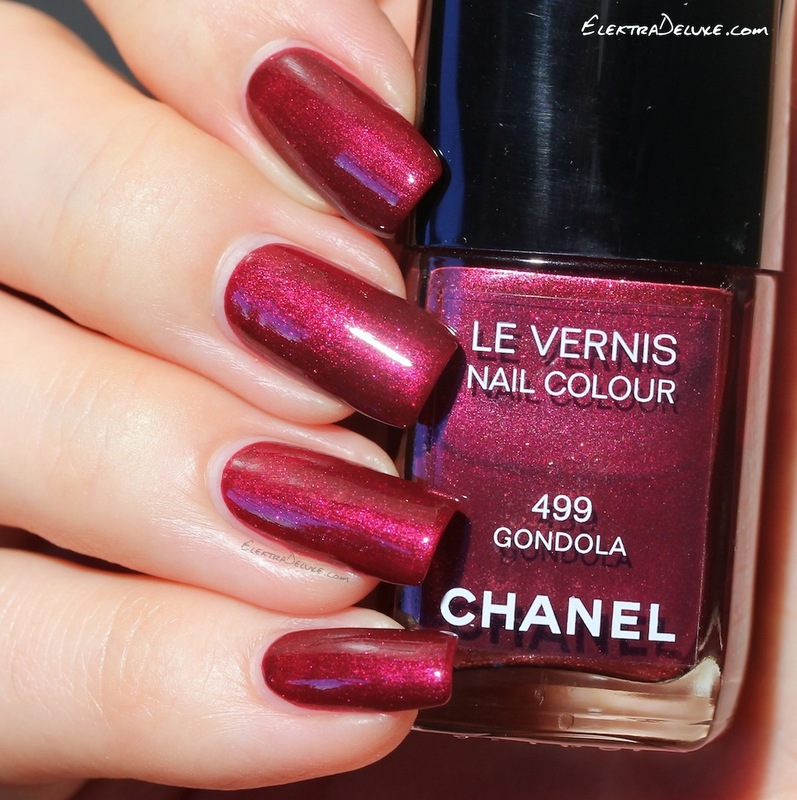 Chanel Gondola is a berry-toned polish with a lovely vivid shimmer. It reminds me of Zoya Teigen but the shimmer is a little more delicate. I applied 2 coats. I love it!